Your current customers are your greatest source of new revenue. By nurturing our client relationships, we reduce client churn and increase their lifetime value. That is cold hard cash that belongs in your pocket. Client relationships naturally sour. Over time consumers will naturally start to feel that something new, a change, any change is better, than the same thing. And I don’t want to be insensitive here, but we all know there was nothing more exciting than when we first met and starting dating our husbands and wives or boyfriends and girlfriends. But that newness of a relationship slowly fades overtime, whether we like it or not. And just like a marriage we have to actively put effort into that relationship to make it work. So think about it like this. If you went home to your spouse each night after a long day at the office, but never spoke to them and never acknowledged them… how long do you think they are going to stick around? Well The answer is they aren’t. client relationships need the same kind of attention. We have to actively work to keep the relationship fresh and positive and growing in the right direction. Because unfortunately, something new or different is automatically perceived as better – even when it is not. On my YouTube channel, I did a video on this very topic over the holiday season. The winter months are a perfect example of how important client nurturing is, because it is our industries greatest time of customer churn. Most companies lose the most clients every year during this time, unless they actively maintain that relationship through out the winter months. You should be touching your clients at least twice a month. That could be any number of things. And the more personal the better: face to face, Phone calls, A monthly newsletter, Christmas cards, birthday cards, thank you notes, even personal emails just to check-in occasionally and remind them, they are still our client, we appreciate them and we want to improve their experience with our team. Even if you call and get their voicemail every single time. Keep checking in. The simple act of you or your staff leaving a message, checking in to see how you are doing and how you can improve will do wonders for your relationships. Implement this as a system in your business. just doing this little bit of additional interaction will decrease the chance that a competitor can swoop in and steal them away. So lets switch gears real quick and talk about our marketing message . And one of the best things you can include in all of your marketing. 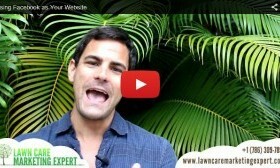 Quick Tip to Nurture Lawn Care Client Relationships ‘Tis the Season to Nuture Your Lawn Care Customers’ Relationships Push Yourself to Grow Your Lawn Care Business How Can I Grow A Lawn Care Business Without Any Money? ‹ What Are Your Goals For the Next 12 Months?